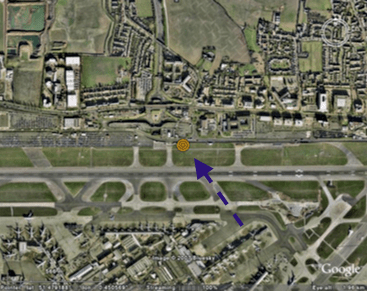 Clive Best has taken a closer look at the conditions at Heathrow when the “record” was set. A BA 747-400 originating from San Francisco, a BA 777 from Tokyo and an Etihan A380uperjumbo all landed within minutes of each other between ~ 14:00 and ~14:30 on July 1. Smaller aircraft normally exit well before they reach that exit, but large heavy aircraft need far more runway to stop. They must exit directly alongside the Met station, and as they turn SE towards the terminals their Jet engines accelerate thereby pumping hot exhausts directly towards the Stephensen screen. 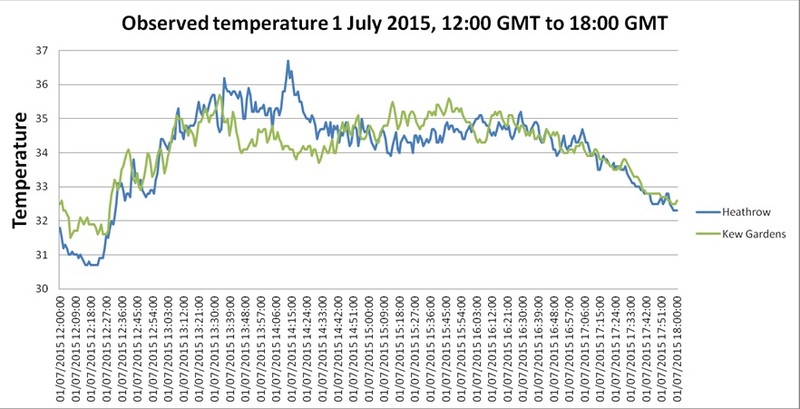 The wind directon on July 1 ensured that those hot gases reached the station. This, in my opinion, is a far more likely explanation for the sudden spike in temperature rather than any short sunny spell. What is particularly significant is that wind speed picked up 14.00. As WUWT points out, in another thoughtful post, the wind was coming in from a SSE direction, i.e. from the runway. Whether jet engines had any direct effect or not, the heat of the sun on the tarmac would certainly have been blown towards the temperature sensor. The final nail in the coffin of the Met Office’s sun theory is that the clouds part for a second time around 14.30, but temperatures continue to decline. The Met Office report that no other station in the whole of the UK exceeded 36C, on the day that Heathrow reached 36.7C. Are we really expected to believe that this little pocket of hot air just happened to pick out Heathrow Airport? ← Charlie Gives Us A Reprieve! Propaganda artists looking for a “record-breaking” temperature are sure to find one. If examined with sufficient detail, the air molecule that moves fastest is the one at the highest temperature. What is staggering is that the Met Office acknowledges the UHI affect when giving out the weather forecast for the likes of the Beeb, but can’t acknowledge that an airfield must be one of the worst UHI going. It makes no sense, unless you wish to mislead, to put temperature sensing apparatus in such a location. I flew into Heathrow at 7:40 a.m., June 13 to attend the Magna Carta 800th Anniversary and flew out at noon on June 19. That is one busy airport, with planes landing and taking off and waiting to land and take off. Unless your purpose is to deceive, why put sensors there? But then, I am a “science denier” and guess my 3 degrees in botany mean nothing since I’m not on board w/ Chuckles. An airport weather station’s function is to tell you what the conditions are at the airport. That’s the airport and nowhere else. They should never be used to cite record warm or cold temperatures or be included in any national/worldwide database for climate purposes. If you’re a pilot landing on that runway just after a bunch of super jumbos, you’d want to know the met conditions at that moment, not the long term climatology. The weather station does exactly what it’s designed to do, it’s the Met office that’s at fault for trying to use it for climatology.